Several villages within the Better Hope/La Bonne Intention (LBI) Neighbourhood Democratic Council (NDC) were flooded as a result of heavy rainfall between Wednesday night and yesterday morning. Students and a teacher with their footwear in their hands manoeuvre through the flooded school yard. Sections of Chateau Margot, Success and Better Hope South were under water yesterday as a result of the substantial rainfall. When Stabroek News visited Chateau Margot yesterday, the area most affected was the front section of the village. 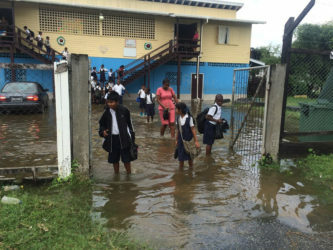 Students of the Chateau Margot Primary School suffered tremendously as the water in the school compound was almost knee high and they had to brave the conditions in order to sit the National Grade Four Assessment. After the exams, students and teachers had to remove their footwear and manoeuvre through the flooded yard until they met dry land. 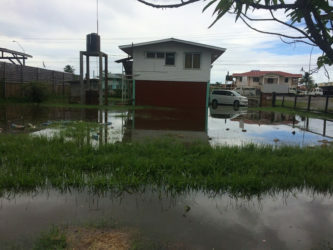 One resident’s yard was filled with water that was at least two inches in depth and he related that it had risen between yesterday morning and afternoon. The man, who asked not to be named, said that several items such as his generator were under water. low-lying areas are quickly flooded. Stabroek News also observed that some of the drains were clogged with vegetation. Chairman of the NDC, Zaman Shaw and overseer Shevon Savory confirmed that they received reports of flooding in the villages and had begun works to clear the drains. The pump at Montrose, which is managed by the Guyana Sugar Corporation, was also pressed into operation. 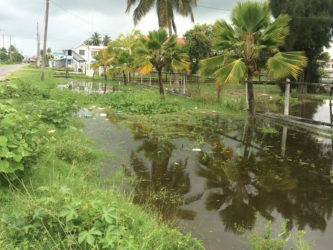 According to Savory, workers from the Com-munities Infrastructure Improvement Project (CIIP) began working to clear the drains prior to the rains. She added that since the flooding, they have received assistance from the Region Four Regional Democratic Council to aid in drainage works. Savoury highlighted that since she took office three months ago, this is the first time she has experienced a flood in the NDC. Additionally, Shaw told Stabroek News that they are waiting on the NDC’s budget to be approved. He said they have budgeted to purchase a mini-excavator to assist the NDC in undertaking drainage and irrigation works in the community. The chairman said the NDC would follow up on the status of the flooded areas and assess if there is a need for emergency works to be undertaken.